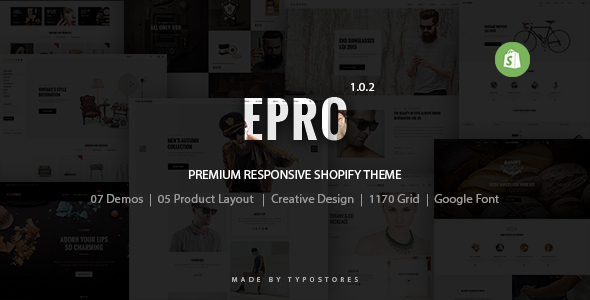 Epro Responsive Ecommerce Shopify Theme Created by typostores. This templates have specific characteristics, namely: We are so proud to introduce you with an elegant responsive shopify theme that can inspire every shop owners and give users new but great experience. It is Epro – Responsive Ecommerce Shopify . You can use this Epro Responsive Ecommerce Shopify Theme on Ecommerce category for carousel, ecommerce, fashion, interior, jewelry, multipurpose, parallax, sunglasses and another uses. This Responsive Shopify Theme is designed specified for fashion shop, watch shop, jewelry or any types of store according to shop master’s purpose. At the very first glance, you all can see that this is a very unique and modern theme thanks to its design. ?pro give users very new and amazing feelings in every actions they do within your site. That is a smart way to impress your customers, let them stay long and even turn back to your shop many later time. Last but not least, Epro Store is also equipped with many powerful features, dynamic extensions such as: Shopify design, Color Swatches, Mega Menu, Blog integrated…so it can help any web master who have not much knowledge and technique a lot. As words cannot transfer exactly how awesome this responsive shopify theme is, so check our demo and have your own experience.